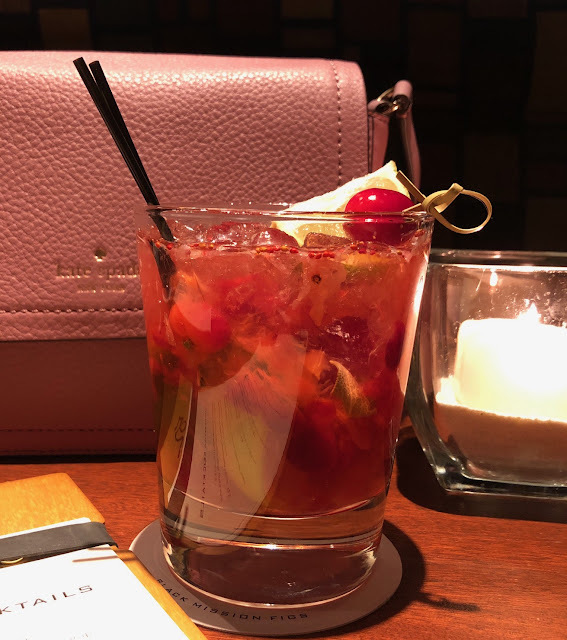 This blog post is sponsored by Seasons52, all experiences and opinions are 100% mine and mine alone. Enjoy the post and please comment with your thoughts! Rob and I weren't able to spend Thanksgiving with our families this year so we decided to find a great little spot and eat out, that way we I didn't have to go to all the trouble of cooking. On Wednesday I did a little research to see where the best spots where when I came across a great little spot called Seasons 52 online, it was listed online as one of the top 10 places in my area for Thanksgiving dinner. They have a seasonally inspired menu, so they're always serving food at it's freshest point when it's in season, and we all know that's when it tastes the best. I had also heard from friends and family that they had great food, so we decided to give it a try, boy am I glad we did. I got super lucky that I was able to get a table due to my late reservation, thank goodness they were more than accommodating and found some room for us. We went to the one at Columbia Mall, in Columbia Maryland. Let me start off by saying that from the moment you pull up they take care of you, they offer free valet parking for their customers. What a pleasure that was! When you walk in the door you see the coolest fountain. The whole place has an air of class due to the modern style decor, with just a hint of Asian charm. The lines are all clean with natural stone and rich red hued wood, for me it all set the perfect tone. We were welcomed at the door, and led to a really cute little booth where we sat. All of the tables where neatly set and everything looked on point, Rob and I were excited and hungry so we got straight to ordering. We both got the Thanksgiving platters which included roasted turkey (white and dark meat) mashed potatoes, savory pan gravy, and herb stuffing, fresh green beans, housemade cranberry relish, mashed butternut squash, and a delish dessert. The butternut squash was topped with pomegranate seeds and the rest scallions. I also ordered a Cranberry & Sage Cocktail, wow was is good. Our waitress Monica was super helpful, she explained everything on the Thanksgiving menu to us, as it was our first time dinning at Seasons. If you go ask for her, she's a great waitress!! The turkey we ate is called Roasted "Never Ever" Turkey, because it's turkey that has never ever been given antibiotics. I love that because now-a-days it's hard to get clean food that you feel good about eating. Seasons has so many amazing healthy choices that taste absolutely out of this world. Everything on the plate was great, I don't have one complaint. I really liked the turkey and green beans, and the mashed potatoes and gravy.. WOW!! Rob mimicked my every thought, he loved everything as well. Then just when I thought I couldn't eat another bite and it couldn't get any better they brought out the dessert tray. As you can see in the pictures below it was amazing, you guys know me with dessert...it's the best part of the meal..lol! I got the S'mores to the right and Rob got the Pumpkin to the left....so rich and yummy. I also loved that it was just the right size too. I can tell you one thing we'll definitely be going back. I can't wait to try everything on the menu. They also have a bar w/a great Happy Hour that I can't wait to go back to check out. Right now they're running a special, if you buy $100 in gift cards you get a $20 bonus card to enjoy the New Year. You'll also receive a 10% bonus gift card when you spend $500 or more. You can't beat that, a Seasons 52 gift card is the perfect gift for friends and family. That's a meal that they'll definitely thank you for. We were good and full when we left, and I told Rob how I loved that all throughout the meal they checked on us to make sure all was well and we were happy. It was the best service and everyone was really nice, I recommend this restaurant 100% and like I said we're for sure going back, when you find a good little spot like this you don't forget it. I am really curious to go back and try another one of their signature cocktails. I would have to say you aren't to fast at the Black Friday Sales when your tummy is packed full of turkey...lol! We went to Arundle Mills Mall to take advantage of the sales and get a few things. I also wanted to see if I could grab a bag from Kate Spade for my girl Lei. Everything was 75% off, and I managed to get her the most adorable bag for under $70. She's gonna love it!! I also hit up Victoria's Secret (as y'all know) one of my absolute faves. I also dropped in American Eagle Outfitters to grab a couple pair of jeans, 40% off definitely speaks to me. When there's sales like that I just can't resist. I make a metal note of all the stuff I want during the year for sales like these. I scored big at Kate Spade during the Veteran's Day sale, I got the cutest little lavender bag shown above for under $70. When I get a deal like that a girl tends to feel proud of her self. I went into Micheal Kors and after waiting 15 mins in line just to get into the store, I did a little looking around and found a really cute bag for $80. Then I got a look at the line to check out and decided I wasn't going to wait. Now you guys know how much I love MK, and that it had to be dam bad for me NOT TO BUY that bag...lol!! I had to wait in line to get into Kate Spade too, but they had 5 cashiers so the line moved super fast. WOW was that mall packed full of people, we also stopped at Best Buy to get one pf those flat screen televisions to replace the security monitors, but they were all gone after 30 minutes. Oh well guess we weren't fast enough, I'm just glad it was an uneventful trip because I'm exhausted from all the eating and shopping. (My Instagram Page) for upcoming shots of dinner and the great stuff I scored at the sale today. Enjoy the rest of your Thanksgiving Holiday Everyone!! I love Seasons 52! I never knew they did Thanksgiving dinner, looks yummy! I love Season 52! Happy Thanksgiving! This looks so amazing. Love this restaurant have a happy thanksgiving! That sounds awesome especially since I don’t cook! Ha ha then you will LOVE ❤️ this place for sure!! Looks like a nice place for dinner. The food looks so amazing! Especially those desserts and drinks. Thank you for the great pictures and review. Looks like a wonderful meal and I love that pink bag!!! I'm from Baltimore and still have family there; I'll recommend the restaurant to them! Never eaten there but the interior and food looks amazing! Looks fabulous! You have an absolutely lovely blog, thank you! You are an inspiration! WOW what a meal! Looks delicious!! and not having to cook is the best! Would love to go there... dinner looks delicious wow! What a nice restaurant and the food looks so yummy! That looks wonderful! Sometimes it honestly is just so much easier to go this route! Looks fabulous, made me hungry! That food looks delicious! YUM! Always love roasted meat and barbecue. Be My Guest.... Or is it the other way around? I’ve never heard of this restaurant. Definitely stop in if I see one. That looks like a really good restaurant. Your food looked delicious. Yum! Yum! Ripped jeans aren't my thing but you rock them pretty good. Wow the restaurant and food look amazing . Would love to go. Amazing looking food. Hope it tasted as good. I keep telling my brother we need to get together more with his family and guess what there are 2 Seasons 52 near his home in Atlanta! Now we can have a fuss free Thanksgiving, or any other meal. You got an awesome deal on the Kate Spade bag & jeans at American Eagle Outfitters! You're my kind of shopper! Thank you for sharing! I've never heard of this restaurant but it's going on my bucket list. Those desserts are so cute. Thanks for posting! I so love those little dessert glasses. Can you eat as many as you want? !